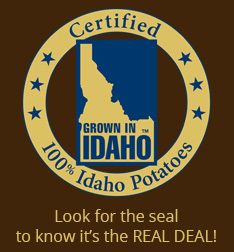 Idaho® Potatoes are naturally 100% gluten-free! With the rising awareness of gluten intolerance and celiac disease, many people are searching for delicious and nutritious gluten-free options. Following a gluten-free diet can be a challenge, and sorting through the lists of foods permitted can sometimes be overwhelming. Fortunately, many foods are naturally gluten-free, including some whole grains and all fruits and vegetables, including the potato. Idaho® potatoes are nutritious, delicious and 100% gluten-free. They are also an excellent source of fiber, which may be lacking in the gluten-free diet, as well as other important nutrients. Celiac is an autoimmune disease that causes inflammation of the lining of the small intestine and prevents it from properly absorbing nutrients from food. The inflammation is caused by eating gluten, a protein found in wheat, barley, rye and sometimes oats. Celiac disease currently affects approximately 1 in 100 people in North America. This inherited disorder affects more women than men, and the symptoms can vary greatly from person to person but may include abdominal distress. Emerging research indicates that people can be sensitive to gluten without having celiac disease. Gluten intolerance, or gluten sensitivity, is a non-autoimmune response to eating gluten-containing foods. Unlike celiac disease, it does not cause damage to the lining of the small intestine, but may still cause abdominal distress. If you are trying to reduce or eliminate gluten from your diet, we've compiled some of our favorite recipes that are gluten-free. However, brands and ingredients may vary, so we always recommend checking the label on the products you choose to use.